This Week In DOCTOR WHO History: Dec 13th to Dec 19th | Warped Factor - Words in the Key of Geek. Two penultimate episodes from two Fourth Doctor stories get us underway this week. Firstly in 1975, an audience of 11.4 million tuned in to The Android Invasion, sadly less than half that were watching in 1980 when 5.4 million saw State of Decay. The final part of Doctor Who's first adventure aired today in 1963 to an audience of 6.4 million people - that would be An Unearthly Child episode 4, The Firemaker. Five years later and Patrick Troughton was starring in the penultimate episode of The Invasion. 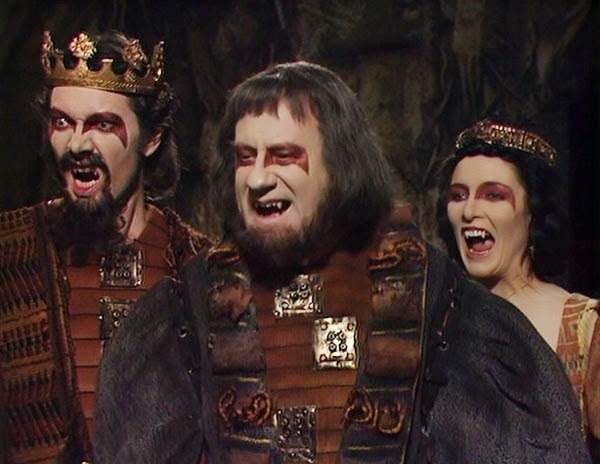 Episode Seven was broadcast in 1968 and watched by 7.2 million viewers. 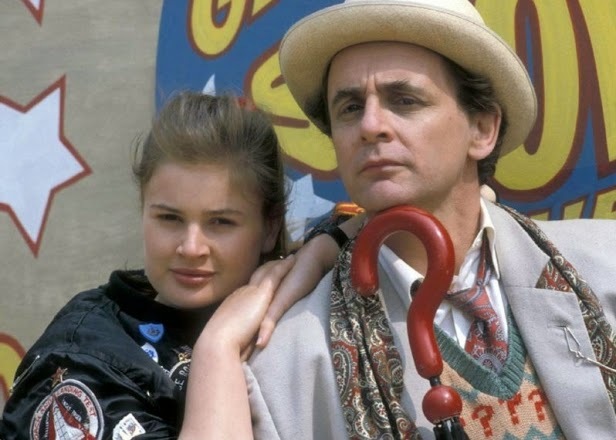 One more classic Who story for December 14th - this day in 1988 (it was a Wednesday by the way) saw the start of a new adventure for the Seventh Doctor, with The Greatest Show in the Galaxy drawing an audience of 5 million. 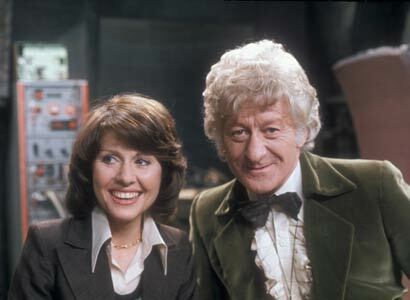 On this day in 1973 season 11 of Doctor Who got underway with the Third Doctor meeting a young journalist called Sarah Jane Smith. The story was The Time Warrior, and also marked the very first appearance of The Sontarans. Part one was watched by 8.7 million people. The final part of the Fourth Doctor adventure Nightmare of Eden was broadcast in 1979, and watched by 9.4 million viewers, and also on this day episode two of The Sarah Jane Adventures story Enemy of the Bane was broadcast in 2008 at 4:35pm, and watched by 0.82 million viewers. The Second Doctor adventure The Ice Warriors reached its conclusion on this day in 1967. Part 6 of the story was watched by 7.5 million viewers. Also reaching its conclusion was the Fourth Doctor adventure The Androids of Tara. The 1978 story had an audience of 9 million. It's not a TV show but still some Doctor Who you might've been watching! 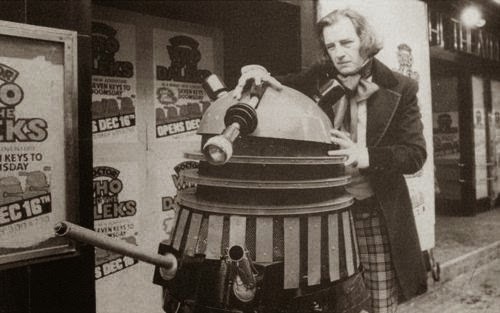 On this day in 1974 the Fourth Doctor made his stage debut - but it wasn't Tom Baker! Although Tom had been seen briefly at the end of Planet Of The Spiders, when Jon Pertwee regenerated, another actor played the Fourth Doctor before Baker properly took control of the TARDIS for his first full adventure. That man was Trevor Martin, (who had already played a Time Lord on screen in the Second Doctor adventure The War Games), he starred in the stage show Doctor Who and the Daleks in Seven Keys To Doomsday. Penned by Terrance Dicks, the show opened at the Adelphi Theatre two weeks before Baker's debut story Robot began. On this day in 1966 the Second Doctor met young Jamie McCrimmon for the first time, and a beautiful friendship began. 6.7 million viewers tuned into episode 1 of The Highlanders to witness the event. Whereas that was only the beginning, The Sun Makers was coming to an end. Part Four of the Fourth Doctor adventure was broadcast in 1977 and watched by 8.4 million viewers. Finally on this day it's Torchwood time. Or to be more exact Torchwood: Out of Time which was broadcast in 2006 at 10:00pm and watched by 1.03 million viewers. 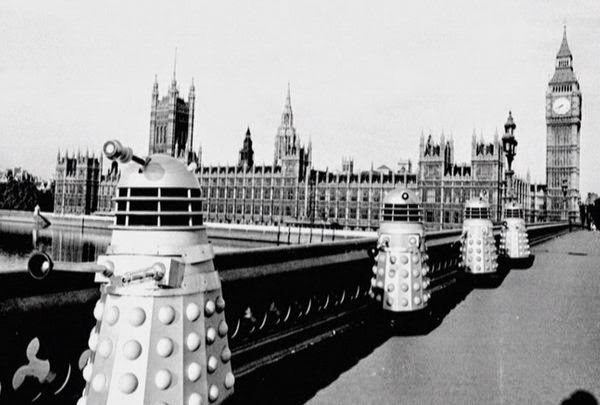 Two days and two Dalek stories for you. 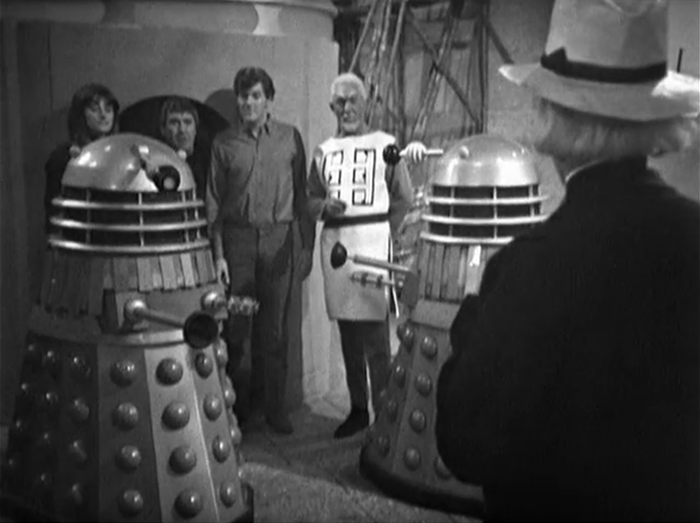 First up it's episode 6 of The Daleks' Master Plan, entitled Coronas of the Sun, which was broadcast this day in 1965. It's one of the installments that is on the missing list so only the 9.1 million people who tuned in have ever seen it. Also on this day the final part of the 40th Anniversary animated web adventure Scream of the Shalka was released onto the BBC's Doctor Who website at noon on this day in 2003. Wrapping things up for this week in Doctor Who history we head back to 1964 to find 'Grandfather' getting ready to say goodbye to Susan. She'd be off next week, first though she'd need to survive part 5 of The Dalek Invasion of Earth, entitled The Waking Ally, which was broadcast at 5:40pm, and watched by 11.4 million viewers. So did you watch any of these adventures live? We'd love to hear your memories about any of them. Tell us in the comments below.